Miraculous Rose of Mystica statue cried tears of oil, received kisses from Heaven which was gold dust. Also statues white rose turned half pink. April 27, 2003 My Rose of Mystica statue cried tears of oil, when I had it at a shrine. It only cried once. I brought the statue to [Audrey Santos] house and the nun put it in Audrey's room. All of a sudden, the sister came running out of the house and said, Who has the Rose of Mystica statue. I said, That I did. She told me that it was receiving kisses from Heaven, which was gold dust/[Escarchas] all over my items.The gold dust is still in the crevices of the statue. 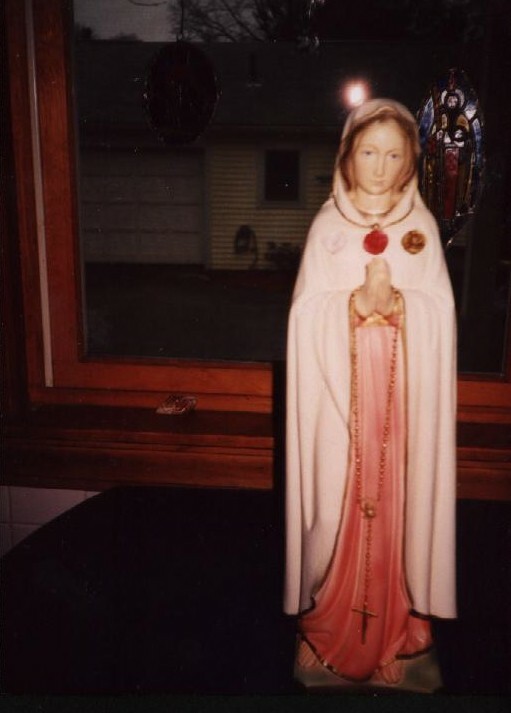 Then, another time, At another shrine, I left the statue in the apparition room, where Mary was appearing, and when I picked it up, I noticed that there were two red spots on the white rose. I thought that the rose might start bleeding, but in front of my eyes, and two of my friends, the rose turned half pink, and stayed that way until this day. I asked Mary why she did not turn the rose totally pink, and I received the answer, That if it was totally pink, people would have thought that it came that way, but by being half pink, people would recognize the miracle. She wants us to pray for an increase to vocations to the Priesthood. That is what it symbolizes. Note from webmaster: Diane Lyons Frasco has been a visionary and locutionist for thirty years. She has been a Secular Carmelite for 14 years and the youngest in her Order. She is contemplative women, and has received many gifts one of them is the gift of bilocation. Diane receives certain assignments from Heaven and does them. She has permission from her spiritual director to release messages. Diane states that is rather shy and is not looking to be famous or anything like that, and only wishes to do the will of God. You can contact Diane at Artistspaint@aol.com.